We can’t deny that the ecosystem of our earth is out of balance today. If everyone lives as we do in the West, then eventually we will need more than one planet. That is why we limit our ecological footprint as much as possible. 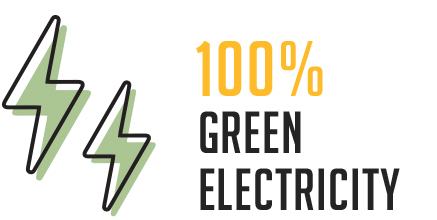 All electricity we buy for the brewery is 100% green, from renewable sources. And that is not the only measure we've taken. When we think of sustainability, we often only think of environmental sustainability or the use of natural ingredients. When using such ingredients we must, indeed, make sure that they are not exhausted. However, we should not ignore economic sustainability, where the growth of competitiveness – almost literally – is soundly combined with respect for people and nature. With every investment or technological change, we examine whether, and how, we can keep negative impacts on people, the environment and our surroundings to a minimum. When considering a new investment or change in technology we also check if and how we can minimize any negative impact on people, the planet and our environment. Research & Development is an important component. This leads regularly to the development and use of prototypes and applications with a demonstrated positive environmental impact.We have various partners who come to us to install their future equipment as a prototype, because they know that our brewery is also continuously in search of high quality, a more refined use of raw materials and environmentally friendly beer, that's mainly nation of craftsma and great ingredient However, the equipment and technique are also crucial, along with the partnership with forward-thinking suppliers and experts. 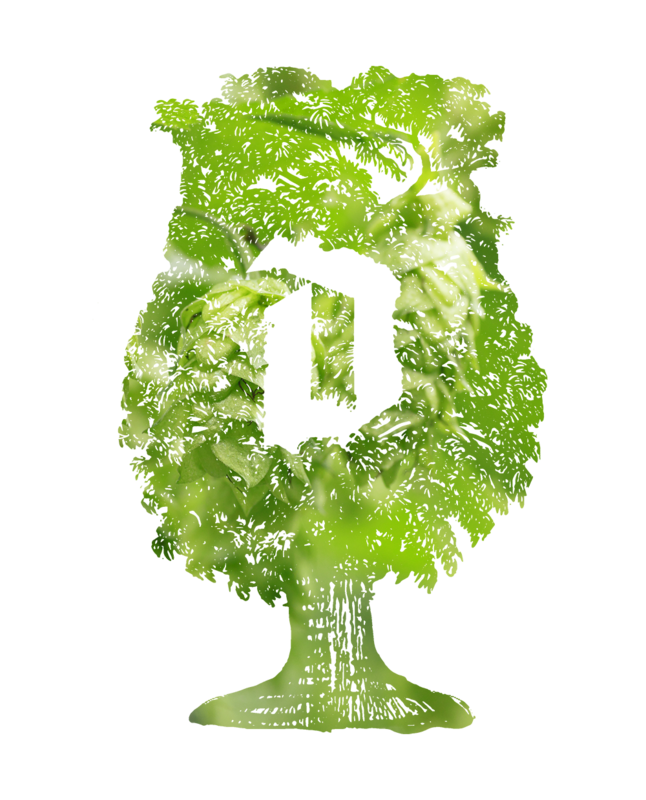 For brewing our beers we use water, barley malt, hops and yeast as traditional basic ingredients. Our suppliers are chosen not only for the fact they provide the best quality raw materials, but also because they have a social responsibility and are focused on sustainability in their economic activity. The nature of their crop-based activities means that they are closest of all to nature and are therefore even more aware of ecology in their business than other producers. Our hop and malt suppliers in Europe work permanently to reduce their carbon footprint, energy efficiency and achieve more economical water consumption per weight of raw material. They all adhere to one or more certified ISO quality systems such as ISO-50001 and ISO-14001. Their global financial efforts to harvest, process and transport their crops with larger amounts of self generated renewable energy are remarkable. These energy sources often include biogas generated from water purification and innovative installations for cogeneration (Combined Heat and Power or CHP). MALT. During filtration of the wort, we separate the solids in the ‘batter’ brewing water with crushed barley malt from the liquids. 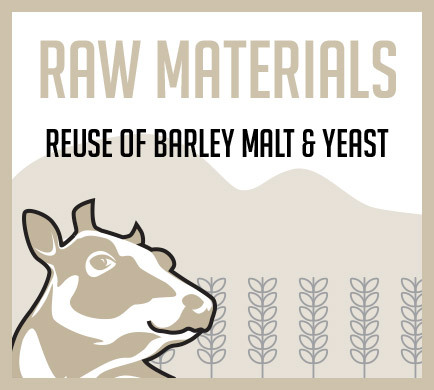 The remaining solids, which are in fact the undissolved barley malt, are known as draff. This is a protein and fiber-rich addition to cattle feed. This draff is collected from our brewing room by various local cattle farmers. Duvel draff has a rough texture which provides extra stimulation of the cow's gut, improving digestion. Cows are said to gain a more glossy coat when this draff is added to their food. Using this beer draff means it is possible to reduce the amount of other sources of protein, which are mainly grown at the expense of local ecosystems and shipped from other continents. It is logical that the amount of the valuable draff has increased over the years along with the growth in the number of hectoliters of beer that we have brewed. YEAST. At the end of fermentation and storage the yeast cells are separated from the beer. This yeast is sent to local farmers and used as pig feed. SEDIMENT. Another example of a by-product that contributes to the so-called circular economy is the sediment (biomass) from the aerobic part of our water purification that is reused as a soil improver in agriculture. Good energy management counts. 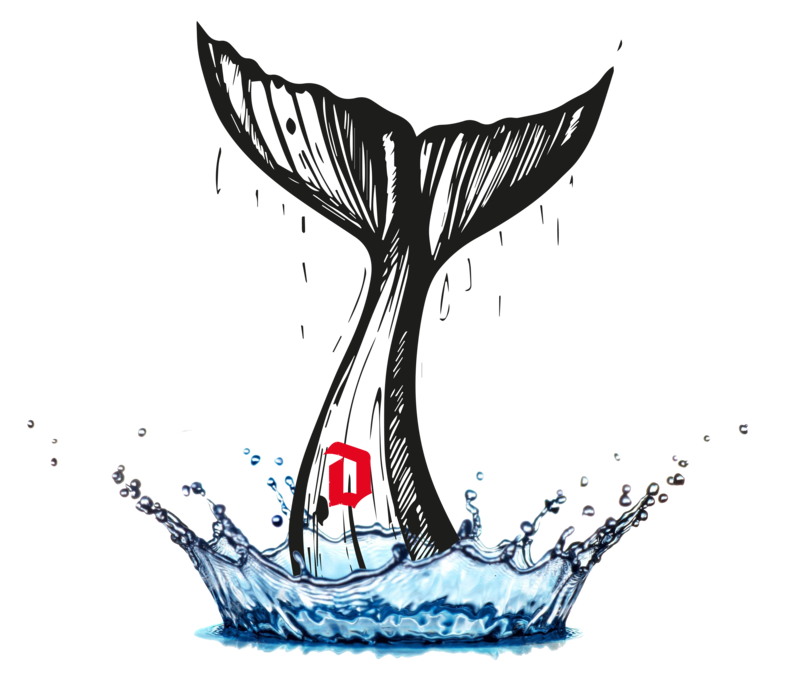 Internal recovery processes are important. We heat our company buildings and warehouses using the warmth produced by fermentation. This is one example of a closed circuit with which we prevent emission and waste flows. A closed circuit like this is also used to warm our cellars where the second fermentation occurs with heat that we collect from... the cooling system in our huge ageing rooms. We also use steam condensation in the brewing room to heat the following brew to almost boiling point. WE ARE CONSTANTLY TAKING MEASURES TO REDUCE OUR EMISSIONS TO A MINIMUM. THE CHALLENGE TO INCREASE OUR BREWING EFFICIENCY IS ONGOING. MEANWHILE, ALL THE ENERGY WE PURCHASE IS GREEN AND CARRIES CERTIFICATION OF A GUARANTEED SOURCE. BIOGAS IS USED AS FUEL FOR OUR STEAM GENERATORS. 12,500 M² of solar panels can be found on the roofs of the maturing cellars. Every year these produce 633 MWh of eco-friendly electricity, comparable with the average energy consumed by 180 households or 4 % of the brewery's total electricity consumption. In our Duvel Logistics Ruisbroek warehouses all forklift and reach trucks are electrical. They ‘fill up’ directly with electricity from the solar panels on the roof. Heat is released during fermentation. This is known as an exothermic process. By cooling the fermentation tanks this heat is recovered and used as energy for processes requiring warmth. We heat our offices and cellars, where the beer is kept to re-ferment for two weeks at 24°C, using the energy from the fermentation process. REUSE COMPARABLE WITH THE AVERAGE ELECTRICITY CONSUMPTION OF 1,500 FOUR PERSON HOUSEHOLDS. In our new modern water purification installation (2017), we now purify the waste water to way beyond the strict environmental standards. We also use more and more of the energy, raw materials and water released from that purification process. Methane gas is extracted from the anaerobic part of our organic water purification, where 80% of the organic waste materials are removed. We reuse this biogas to drive steam generators. Every year, we are able to reuse a quantity of biogas from our water purification process. 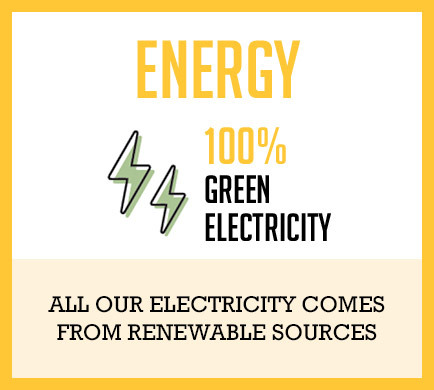 All the energy we purchase is one hundred per cent green and carries official certification of its guaranteed source. This electricity comes largely from Scandinavian hydro plants. Since early 2017, over 20 sea containers filled with Duvel Moortgat beers have been traveling each month along the inland waterways from the container terminal in Willebroek to the ports of Antwerp or Rotterdam in order to be sent to China. We do this in partnership with the family business ODTH, who have already won the VOKA Economic impact Award. The ODTH shipping terminal is along the sea channel between Brussels and the river Scheldt, 2 kilometers from the brewery. We first commissioned these shipments at the end of 2016. This method of transport is more ecological. Inland waterway transport creates less than half the CO2 emissions compared to traditional lorry transport. It is of course also a better choice when you consider the traffic congestion. On site at the brewery we are carrying out measurements as part of the Flemish Energy Policy Agreement (EPA), allowing us to contribute to the Flemish and European climate and energy objectives. In this internal EPA audit, we are gathering data about the current and historic energy consumption, the processes and utilities and developing very specific energy- saving measures. An example: in 2016 all office lighting was adapted from type T8 to T5 lamps. These are 17% more efficient. They provide more light and last longer. LEDs. In the production environment, company car parks and storage areas old lighting is systematically being replaced with more economical lighting. So, for example, in the cold and warm maturing cells we have placed energy saving LED lighting of a type that contains little or no blue or UV light which means there is no light that can harm the beer maturing in the bottles. In Duvel's cold storage alone, we are already using around 60,000 KWh less in lighting. Also our well-known advert ‘Ssst... hier rijpt den Duvel’ (Shhh... here's a Duvel in the making) along the A12 in Puurs-Breendonk was recently completely renewed and refitted with economical LEDs. Equivalent kilograms of carbon dioxide per hectolitre of beer brewed .Kg CO2 e/HL. Caused by purchased CO2, CO2 for med by yeast, CO2 released in the generation of electricity and incineration of natural gas/propane. The objective for 2020 is 20,1kg CO2 e/HL. 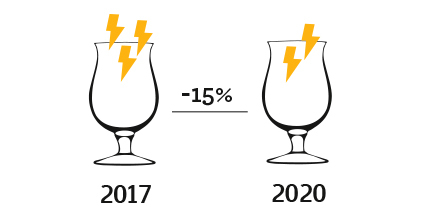 Electricity & natural gas consumption in Megajoules per hectoliter of beer brewed. The objective for 2020 is 190 MJ/HL. There is literally lots brewing in the brewery. This includes all the various steps in the brewing process itself, and also the supply of ingredients, whether internally or from external suppliers, the moving and stacking of beer crates, the treatment of thousands of bottles in our bottling plant, and plenty more besides. At duvel moortgat we aim to carry out such activities as safely and ergonomically as possible. Prevention therefore plays a crucial role. In 2017, 640 Duvel colleages attended 1870 hours of training and courses that were either directly or indi- rectly connected to working safely. Besides a group that were given an extensive safety training together with our prevention advisor we also organized a range of job-related training. In our Duvel Logistics warehouse, for example, (future) drivers of forklifts, reach trucks or electric pallet transporters learn how to drive, maneuver and transport goods safely, to avoid both physical and material damage. Also the balance between safe driving behavior and producti- vity is included in the training. The ‘Load security’ course is a permanent feature in training our lorry chauffeurs. First Aid and AED (automated external defibrillators) are key components in the internal training curri- culum. Even those with no specific First Aid training learn how to react efficiently and offer help in serious situations during the ‘Intervention’ training with simple but essential actions that can save lives. It goes without saying that the Food Safety course features regularly on the training menu for people who come into direct contact with ingredients during their work and those involved in the brewing process. The focus on prevention of accidents at work leads to a reduction in the frequency rate year after year. The result can still be improved with extra measures, improving awareness among employees and training. Our objec- tive for 2020 is therefore to reach the reduced frequency rate of 5. Our planet and its resources are not endless. the less we consume natural sources, the more chance we give nature to breathe. In a circular economy raw materials and products are reused a maximum of two times and value destruction is kept as low as possible. This is possible by recovering waste materials and giving them a second life. This starts by sorting waste flows and continues with processing and recycling. The reusable, eco-friendly Duvel beer crates that are in circulation are all made of recycled polyethylene, with no additional harmful heavy metals. Duvel Moortgat was the first brewery to develop such a crate, which also accomomodates all kinds of packaging. This allows us to fit various packs into a single kind of crate, which saves on sorting and transportation costs. Empty bottles returned to the brewery are thoroughly cleaned and inspected for damage. After cleaning and rinsing, each bottle is inspected by the strict electronic eye of the Empty bottle inspector (EBi). This takes ten photos of each bottle from different angles and checks whether it may be refilled. 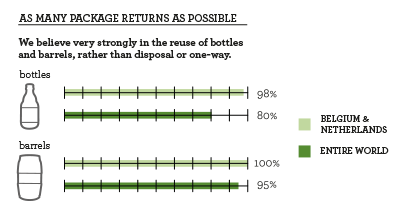 When bottles no longer satisfy the quality standards, due to damage for example, they are collected and recycled. In joining Fost Plus and Val-I-Pac, Duvel Moortgat is committed to avoiding packaging waste, using environmentally friendly packaging and the maximum recycling of packaging waste. 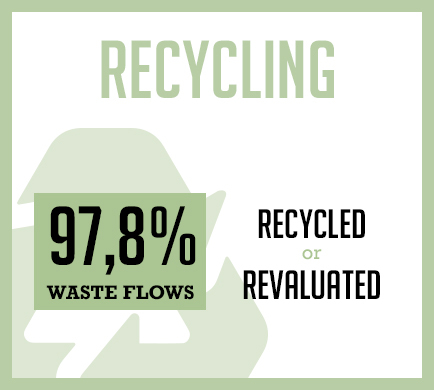 Every year we aim to continue reducing non-recyclable residual waste, currently just 2.2% of the total flow, to reach under 1% of the total in 2020. COMPACT LIGHTWEIGHT BARRELS FOR EXPORT. Beer that is sold to distant destinations is increasingly being filled into recyclable 20 liter barrels (Key kegs). These barrels are subjected to intensive tests and are a valuable alter- native to reusable stainless steel barrels, which we use for more local destinations. Our recyclable barrels are made of 50% recycled PET and are recycled at their destination after use, which means that no transport is required to return the empty barrels. The barrels are also more compact and lighter than comparable reusable stainless steel barrels. This increases the loading capacity per shipment by up to 25%. All of these elements make it better for the environment to use these barrels when selling to remote markets. Paper, from stickers that are soaked off in our rinsing machines is gathered up together with all kinds of cardboard packaging and sent for recycling. We encourage our suppliers to use as much recyclable packaging as they can, which we either return or sort for reuse. The worldwide demand for drinking water was doubled over the last fifty years. This demand is anticipated to grow a further 40% in the next fifteen years. We must use water in a sustainable way in order to protect our natural water supply. It will be of no surprise that water is the main ingredient in brewing beer. Many additional processes, and particularly the cleaning of installations and vessels such as recycled bottles and barrels, mean that lots of water is required in the preparation of beer. 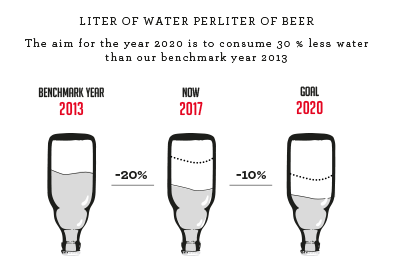 It is therefore quite logical that we, as a brewery, make as many efforts as possible to limit water consumption to a strict minimum. The water used for brewing is mainly water from our natural underground sources located 60 meters below the brewery. We have been purifying the waste water in our production process for almost a quarter of a century. Our brand new water purification station is operational since the summer of 2017. Using a combined anaerobic/aerobic system, we now cleanse the water to far greater standards than required by the strict Vlarem environmental norm, before releasing the so called effluent in a natural water course (the Meerloop). In the small stream which carries our purified water into the river Rupel there are plenty of healthy frogs and all kinds of fish. 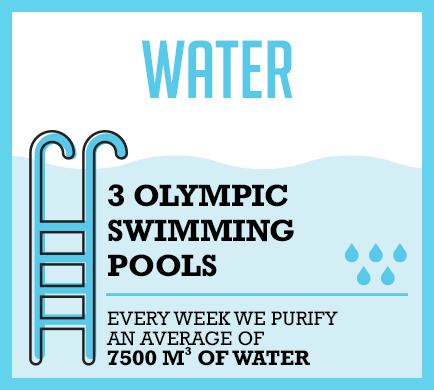 Every week we purify an average of 7500 m³ of water. That is the volume of three Olympic swimming pools. With the capacity of our new, modern water purification installation we could purify the waste water from 84,000 people. By the beginning of 2019 we will be reusing a good 20% of our purified waste water. Use of dry condensers, etc. The biomass created in purifying the water is used in agriculture as a soil improver. We use the biogas as fuel in the steam generators. As from beginning 2019 we will reuse 20% of our purified water, after ultra filtration and reverse osmosis, in a variety of cleaning and cooling processes in the brewery. Over the last few years much has been invested in additional measuring equipment, to carefully monitor all flows of water. At weekly meetings these trends are discussed in detail and improvements are made. Global warming from carbon dioxide is a worldwide problem for the environment. It is essential for our own and our children's future that CO2 emissions from people and industry are reduced quickly and significantly. The commitment at the Climate Agreement in Paris was to keep the average temperature increase below 2°C. Trees are extremely helpful in removing CO2 from the air and therefore in cooling. Duvel Moortgat is actively involved in reforestation projects, in Belgium and other parts of the world (Zambia, Africa). In 2018 we donated €100,000 to WeForest and Bos+ who, as expert organizations, are helping to plant trees in the right places. In doing so they are also carefully considering good-quality, local employment and greater biodiversity. This year an additional 128 hectares of new and refreshing woodland will be added. 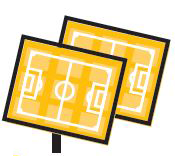 The aim of our donations to WeForest and Bos+ is to achieve a good 380 hectares – that's around 750 football pitches – of Duvel trees by the end of 2020, which will contribute to a better, more healthy climate. Bees are a measure of our environment. Pollination by insects and particularly bees is essential for three-quarters of our food crops. Therefore it's not good news that a third of all bee colonies did not survive the spring in 2013. And this situation continues to get worse every year. A parasite, pesticides plus the worrying decline in suitable natural habitats for bees are the major causes. 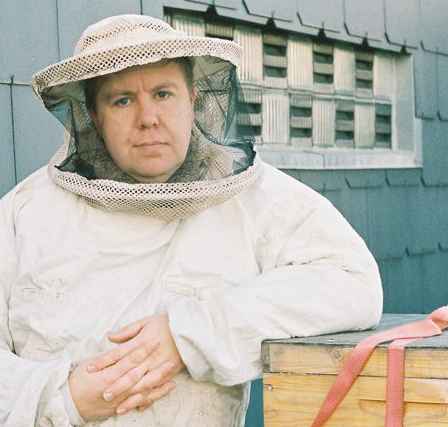 The roof of our new office building is now home to around 160,000 honey bees, in two hives with two queens. Depending on the amount of sun, we have an annual total of around 100 kilos of Duvel honey, flavored not with hops but with the linden tree and a hint of mint. All the profits from the sale of our honey are returned to our beekeeper as extra funding for his fabulous work.